They are very light. As in, about 2 lbs! They hold a charge for a ridiculously long time. We let our FZ-09 sit for 9 months last winter/spring. Fired right up! Made in the USA. Yes, American made lithium batteries! We'll be running a special for the rest of the month: pre-orders will be accepted between now and the end of the month. We're going to place one large initial stock purchase, so all orders will ship during early October. Members who pre-order will receive a 5% off coupon good for anything on our site. Yes - anything. With fall and winter coming up around the corner in the northern hemisphere, this would make a nice hibernation companion. Using L.I. Batteries for a few years now in all our bikes, Track, daily commuter, dirt bikes..... they all start right up strong every time, no issues. Save pounds over lead acid...it's a no brainer. Less weight = stronger acceleration, stronger braking and better handling. 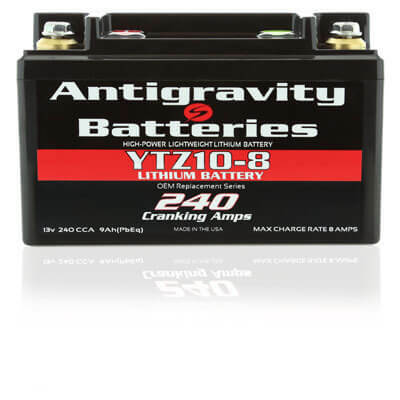 Q: Can I use a regular battery charger on the Antigravity? But really, you won't need to charge the battery for up to a year of storage UNLESS there is a parasitic draw. As I alluded to above, we let our FZ-09 sit for 9 months one time (don't flame! ), and it fired up without any issues whatsoever. Yes - anywhere but Russia. What he said...you don't need a charger with an L.I. battery. And unlike Lead acid batteries, the LONGER you turn them over the STRONGER they get. When they warm up, they get stronger. It's like pulling a box of lead out of your bike...well it is pulling a box of lead out of your bike and replacing it with technology that works so much better.